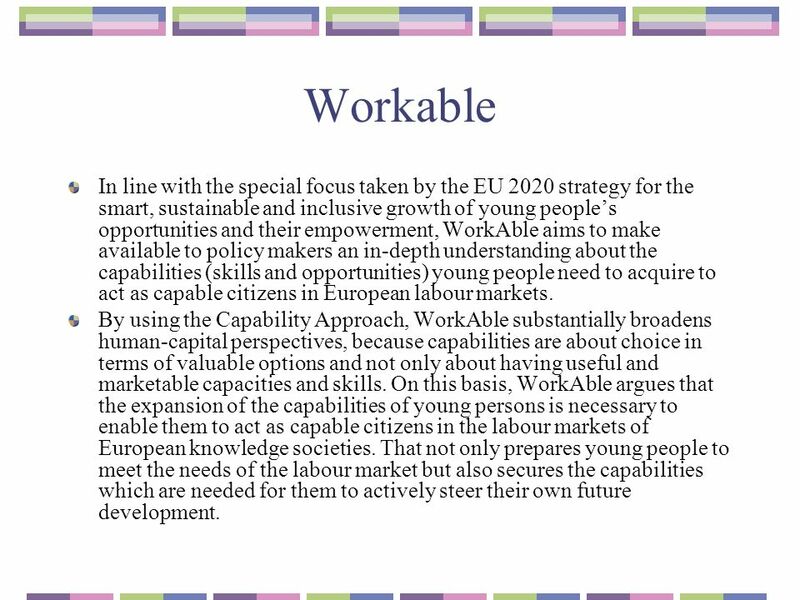 7 Workable In line with the special focus taken by the EU 2020 strategy for the smart, sustainable and inclusive growth of young peoples opportunities and their empowerment, WorkAble aims to make available to policy makers an in-depth understanding about the capabilities (skills and opportunities) young people need to acquire to act as capable citizens in European labour markets. 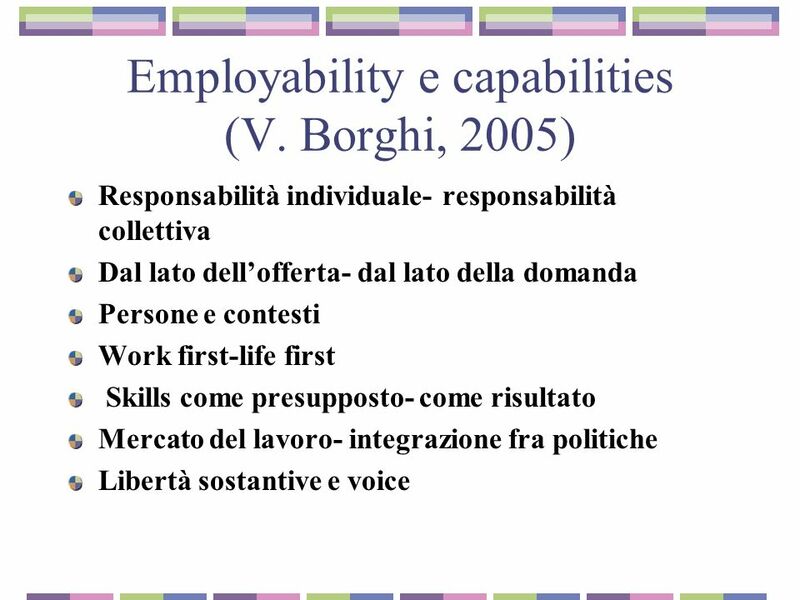 By using the Capability Approach, WorkAble substantially broadens human-capital perspectives, because capabilities are about choice in terms of valuable options and not only about having useful and marketable capacities and skills. On this basis, WorkAble argues that the expansion of the capabilities of young persons is necessary to enable them to act as capable citizens in the labour markets of European knowledge societies. That not only prepares young people to meet the needs of the labour market but also secures the capabilities which are needed for them to actively steer their own future development. 8 Workable More precisely, we refer to capabilities for education, work and voice: The capability for education is the real freedom to choose a training/curriculum programme one has reason to value. This requires looking on the one side at the quality of educational systems (especially their ability to integrate everyone at any stage of the curriculum), on the other side at the ability of young people to make their own educational choices and not to have adaptive aspirations. Likewise we use the notion of the capability for work to indicate the real freedom to choose the job or the activity one has reason to value. This entails investigating: a) the quality of training programmes and of available opportunities in terms of jobs and activities; b) the entitlements linked to job loss and inactivity and their conditionality; c) the way the notion of good work is constructed (who decides what is a good job that is recognised by society and paid as such, and along what criteria). The capability for voice is the capacity to express ones opinions and to make them count when decisions concerning oneself are made. It can be seen as a mechanism by which the other two capabilities are realised. This capability implies that youth have the skills and influence to put forward their viewpoints, are entitled to do this and are free not to express their voice without having to incur penalties. 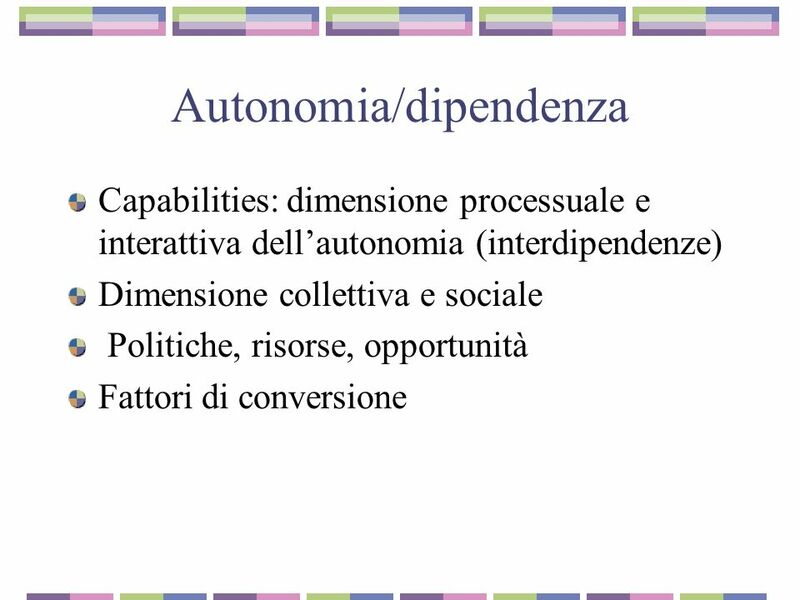 These different capabilities have to be understood in terms of their interdependency and the influence of the different contexts within which they are realised. They encompass specific challenges to public policy and would change the political setting of todays mainstream education, social and youth policies. 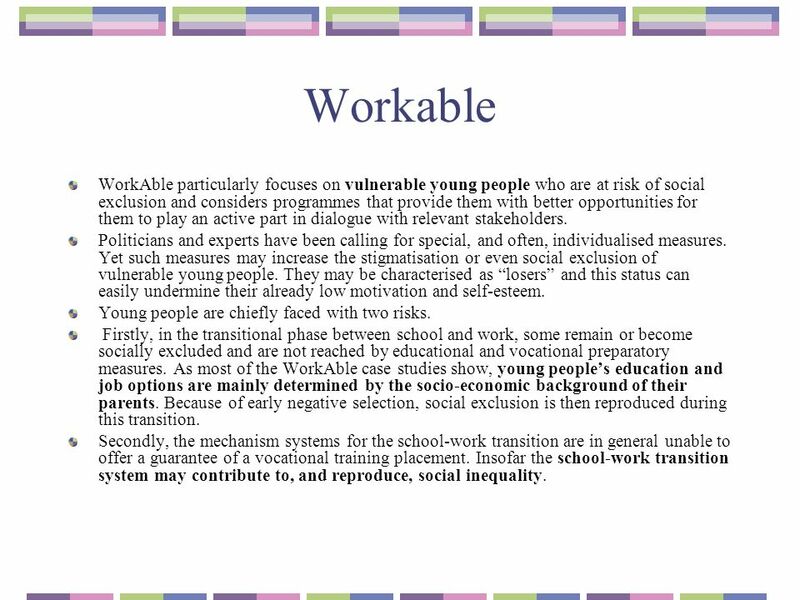 9 Workable WorkAble particularly focuses on vulnerable young people who are at risk of social exclusion and considers programmes that provide them with better opportunities for them to play an active part in dialogue with relevant stakeholders. Politicians and experts have been calling for special, and often, individualised measures. Yet such measures may increase the stigmatisation or even social exclusion of vulnerable young people. They may be characterised as losers and this status can easily undermine their already low motivation and self-esteem. Young people are chiefly faced with two risks. Firstly, in the transitional phase between school and work, some remain or become socially excluded and are not reached by educational and vocational preparatory measures. As most of the WorkAble case studies show, young peoples education and job options are mainly determined by the socio-economic background of their parents. Because of early negative selection, social exclusion is then reproduced during this transition. Secondly, the mechanism systems for the school-work transition are in general unable to offer a guarantee of a vocational training placement. Insofar the school-work transition system may contribute to, and reproduce, social inequality. 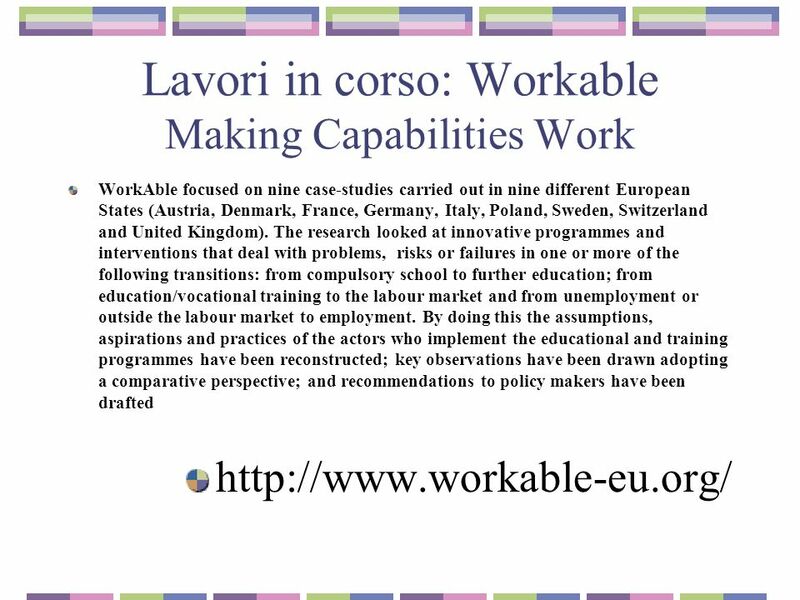 10 Lavori in corso: Workable http://www.workable-eu.org/ Project TRESPASSING – Naples It is settled up in Quartiere Forcella and Quartieri Spagnoli in Naples, two of the poorest and most deprived area in the city. Its aim is to build up personalised paths towards a labour market culture in order to tackle social exclusion and to develop beneficiaries employability through individual and group counselling. It focuses on motivation, competencies of young people and on building up a labour market culture in drop out young people supporting them during the placement and through an apprenticeship in several selected firms in the two neighbourhoods Beneficiaries are young people between 16 and 18 years old with no diploma and no school or vocational training, characterised by a multiple deprivation situation. 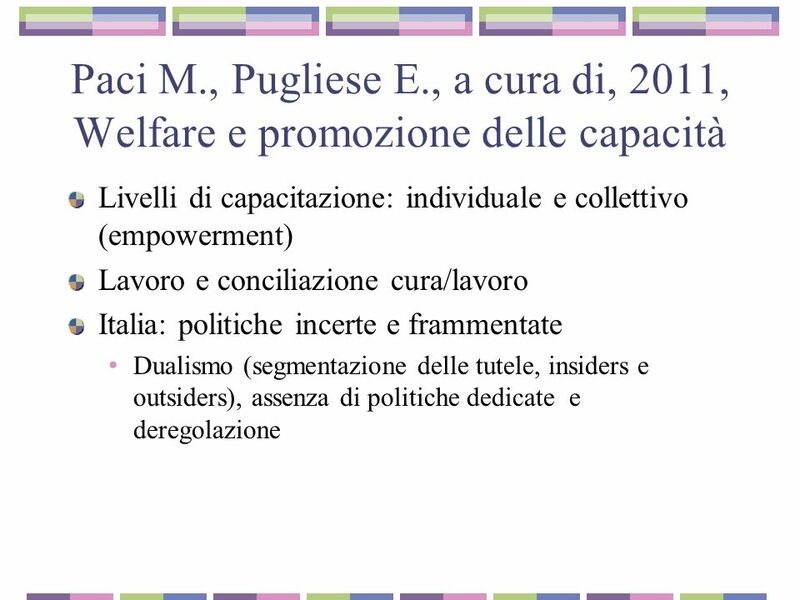 The project lasts 8 months and it is divided in 3 phases: Promotion of group and individual activities about labour market; Employment paths building; Placement. 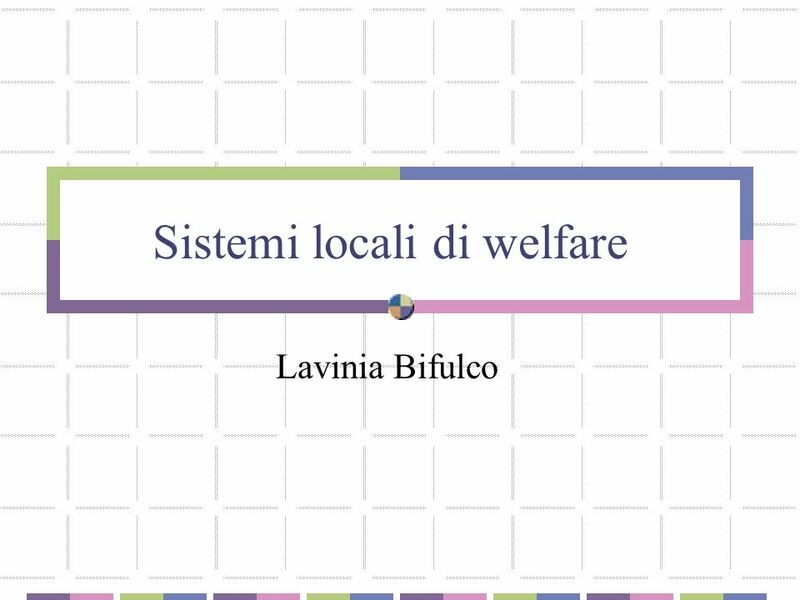 Download ppt "Sistemi locali di welfare Lavinia Bifulco. 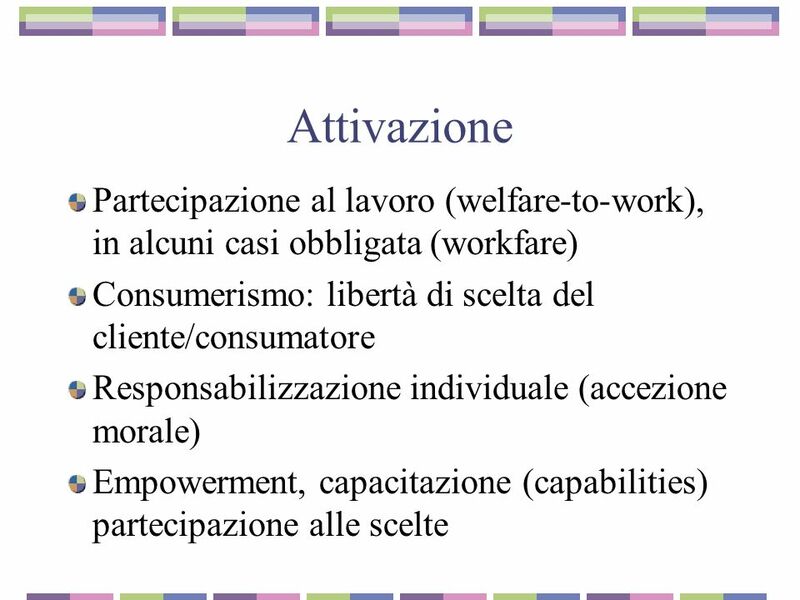 Attivazione Partecipazione al lavoro (welfare-to-work), in alcuni casi obbligata (workfare) Consumerismo: libertà"
Southampton City Council Lydia Wilton. Our Location Southampton. Careers Education in England and Europe Christopher Winch Kings College, London. FUTURE 3.0. Youth policy a purposeful and coordinated activity in different spheres of life that proceeds from the actual needs and challenges of young. ECVET som teknisk rammeverk Oppstartsseminar Oslo 03.06.2013.